Adam Entous and Felicia Schwartz add some details in their Wall Street Journal story “Obama administration threatens to suspend talks with Russia on Syria, considers weaponry for Syrian rebels.” If Russia and its Syrian ally haven’t yet achived their objective, I would guess that they will keep doing what they’re doing. 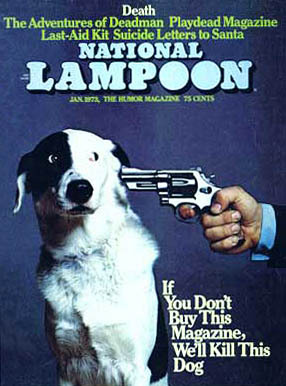 It seems to me that in terms of persuasion, the Kerry threat falls somewhat short of the National Lampoons’s classic If You Don’t Buy This Magazine, We’ll Kill This Dog gambit of 1973, back when Kerry was lighting his path with accusations that American soldiers routinely committed atrocities in Vietnam. By contrast with the Lampoon’s gambit, the Kerry threat may serve as an inducement.